There’s a pretty lengthy Dust 514 dev blog post today on the Playstation blogs and it’s all about vehicles, what role they’ll play in the game and what kind of characteristics you can expect. Since DUST 514 traces its lineage to EVE Online, we wanted to give it the same rich combat environment that EVE Online has when it comes to vehicle classes and roles. For example, in EVE Online there are ships that share the same hull (and thus the same look) but have very different performance envelopes. This will be true in DUST 514 as well with vehicles that will share the same chassis or hull class but depending on their roles and level of technology, offer very different battlefield characteristics. Another key aspect that is similar between ships and vehicles is the capacitor. A good way to grasp this concept is to think of capacitors as the energy source that powers everything in a vehicle. From weapon turrets to repair modules, almost everything that you fit on to your vehicle in DUST 514 will need to draw capacitor points in order to function. Because of the fusion technology that the capacitor is based on, you will never “run out” of capacitors in the long run, since it will always replenish itself over time. However, as you activate weapons, scanners, ECM and other modules over the course of a battle it is very likely that your vehicle will deplete its stock of capacitors in short order. Much like ships in EVE Online, this means that when you customize your vehicles in DUST 514 you will need to pay heed to how much capacitor your vehicle has and how fast the modules on your vehicle will drain it. 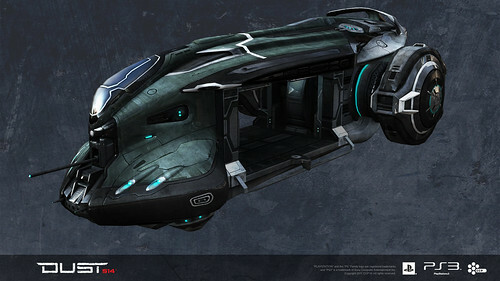 Therefore, along with combat and repair modules, a discerning player will also need to consider fitting modules that will act as a reserve “fuel tank” that can replenish depleted capacitors on vehicles, and this will certainly add an extra dimension to vehicular gameplay that is unique to the EVE universe. Also similar to EVE Online is the skilling system for vehicles available to players. Each class of vehicles will require a player to have trained the necessary skill before he or she can pilot it. This will allow players to explore and specialize in vehicles that are more suitable to their own style of game play, and the variety of vehicle specialization is every bit as deep and wide ranging as EVE Online. So, let’s take a look at a couple of advanced vehicle roles that you, as a player, can look forward to specialize in. 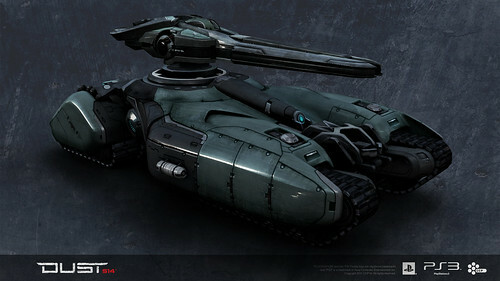 The heavy attack vehicle (HAV) was conceived as a breakthrough weapon and as such is meant to be used as the armored fist by many mercenary forces. However, when the situation on a battlefield changes something even more powerful may be required. This is where the Marauder class HAV comes in. With more powerful armaments and heavier armor, the Marauder can be used to deal with the enemy’s “lesser” HAVs. As you can see from the stats above, the Gallente Marauder offers more module slots giving the player more customization options than the regular HAV. It also has special abilities not available on regular HAVs in that it can fit a siege module, which is a very powerful upgrade that will allow the Marauder to go into “siege” mode thereby granting it even more powerful combat capability. The Marauder also offers role bonuses that give it tougher resistance to enemy fire as well as higher damage dealing bonuses to ensure the death of your enemies. Of course, all that extra performance doesn’t come cheap and the Marauder is by no means invincible… provided that your enemies know its weakness. As you will see in the next vehicle class, we have created a new vehicle role to counter the beast that is the Marauder. The in-game maps in DUST 514 are designed to utilize varying terrain features to give players more tactical choices on the battlefield. That means there are plenty of places to conceal and set up ambushes. The fog of war system will also shroud enemies until scouted by friendly forces. So, how can players counter such an array of concealment in order to quickly reveal and assess the battlefield? The solution is the Force Recon dropship. With its unique combination of speed, stealth, ECM and sight bonuses, the Force Recon dropship will be the mainstay of any mercenary army that wishes to maintain a strong ECM/ECCM presence on the battlefields of New Eden. Worried about what’s hiding in that embankment just around the corner? How many cloaked enemies are waiting in ambush near that upcoming objective? Or, maybe that EW LAV on your team needs a little ECM support? Well, send in the Force Recon dropship to get the job done! Now that you’ve gotten a taste of advanced roles for vehicles, let’s examine some of the vehicle modules that we have in store for DUST 514 and how they will work in game. The cap booster works by replenishing a fixed amount of capacitor points instantly when activated. Each vehicle can only carry a limited amount of capacitor charges, and an empty capacitor booster cannot replenish capacitor points on its own. Sometimes the best way to knock out a tough opponent is to drain its capacitor bank and like EVE Online, the maxim: “no cap equals death” is just as true in DUST 514. Energy neutralizers work by remotely depleting a targeted vehicle’s capacitor bank. It does require a lot of capacitor points to activate it, however, so a capacitor booster module will most likely be required in order to feed the cap guzzling energy neutralizer. There’s an old adage that states “an enemy can’t attack what the enemy can’t see.” and this is certainly the case when we add electronic warfare to the battlefield. Advanced combat vehicles like the HAV require a host of electronic gadgets in order to identify, acquire, and dispatch threats effectively. Electronic counter-measures on the other hand, can leave your enemies blind and helpless on the field and often during critical moments. So, how can a sly player utilize the modules mentioned above to fit his or her vehicle and maximize its effectiveness? Imagine a battle in progress on a distant planet somewhere within the EVE universe. The attacking mercenary forces send in their Marauder in a gambit to break through the defender’s fortifications. As the Marauder smashes its way through barriers and choke points in its mad blitz to the objective, a Force Recon dropship suddenly de-cloaks in midair and begins to drain the Marauder’s capacitor. As the capacitor banks on both vehicles plummet each pilot is hammering the cap booster activation button in a desperate attempt to keep their vehicles supplied with enough power. The Marauder pilot sees his capacitor bank emptied and has just run out of cap booster charges. He calls for help on the squad channel asking, no, pleading for someone to come and rescue him from his predicament. As the dropship batters away the last bit of armor off the Marauder, a friendly LAV jumps off a cliff and simultaneously lands next to the Marauder and activates its ECM module to break the dropship’s lock on the Marauder. The Marauder pilot gratefully thanks the LAV pilot and quickly limps off to the rear for urgent repairs. The info above shows just a fraction of the inter-connected dynamics in DUST 514′s vehicle gameplay and the diversity of vehicle fits that will be available to players in the near future. We hope you are as excited about it as we are. P.S. The retreating Marauder was later destroyed at a choke point by an ambush party before it could be repaired.